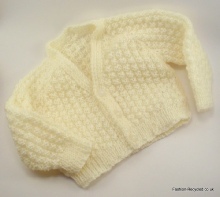 This lovely basic DK cardigan is available in different options, please see the drop down list. You can have this cardi in any combination and in any colour double knit wool. This cardigan is ideal for nursery school uniform. This is the chart from the pattern so please take it as a guide. The standard baby colours are Baby / Pastel, blue, yellow, pink, green and white. Make time: 7 days after sourcing the yarn. 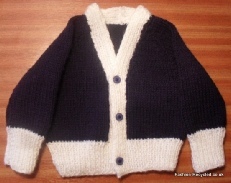 This is a brand new hand made boy's cardigan, made with Baby Double Knit (Dk) wool. To fit 20 in size chest. Roughly 3 - 6 months. You can order this cardi in Blue, Yellow, White or Green and it is made for you. If you would like a combination of colours, please contact me before ordering. This cardi will take roughly 7 days to make, but this depends on what other orders I have going at the same time. Please e-mail me before buying if you have a certain date in mind. I will do my best to accommodate you. All of my handmade items come complete with spare wool for repairs and a spare button. Due to the pattern this cardi can only be made in this size. This cardigan has a diamond pattern with in the holes. It is knitted using double knit wool so is available in loads of colours. It can be knitted in both baby and child sizes. This cardigan can come with a ribbed border, as shown in the photo or a lace border. It has 3 buttons to fasten down the front edge. This beautiful cardigan is knitted in 4 ply wool. 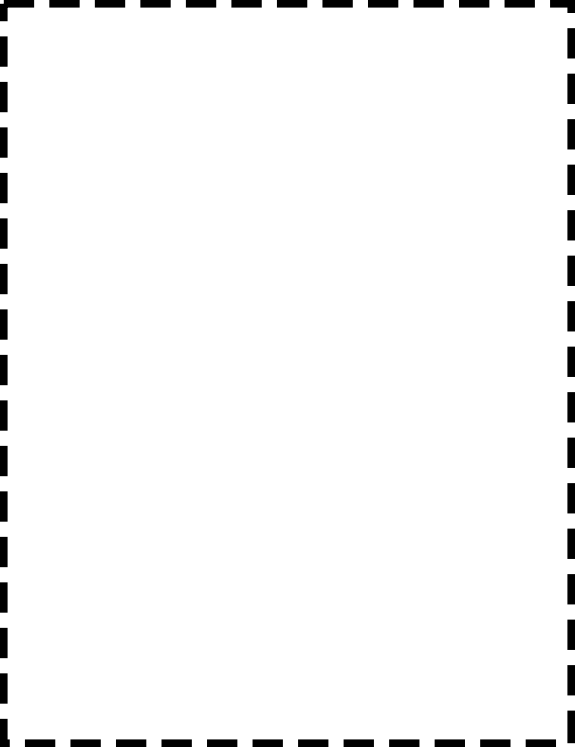 It has a feather like pattern on the lower half and stocking stitch top half and sleeves. It can be made for a boy or a girl. 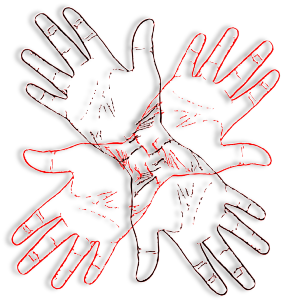 There are 4 / 6 buttons alone the centre front depending on the size. This can be made with any 4 ply yarn. It is also available in Child sizes. This beautiful cardigan is knitted using chunky wool. It has an inside button to hold the inside wrap. This is great for pairing with a dress. This cardigan is part of a set and has a matching jacket, sweater and hat which will also be on this page. They will be available as a set in the near future, please contact me. Make time: 14 days after sourcing the yarn. This can be made with any 4 ply yarn. It is also available in Baby sizes. This beautiful cardigan is knitted in 4 ply wool. It has an all over feather like pattern. It can be made for a boy or a girl. 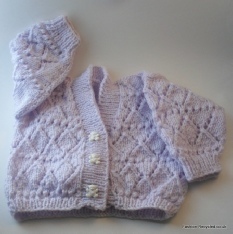 This wonderful knitted cardigan has a pretty trellis pattern with twist details. 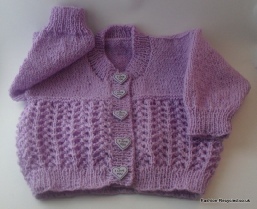 It is for girls only and is knitted using 4 ply wool so is lovely and light. 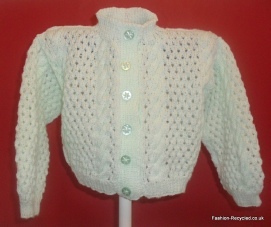 It is a round neck cardigan with 6 / 8 buttons down the centre front. 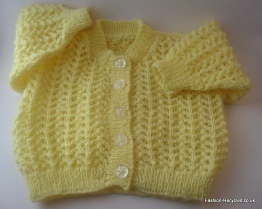 It can be knitted in any 4 ply wool , so please add colour or yarn details in the box and any button details too. This is a great wrap over cardigan. It is knitted in double knit wool and is available as short or long sleeve with an optional lace style edge. The cardigan is secured via a strap which ties around the waist. The one in the photo was knitted using streamer yarn, so the colours are mixed in , You can choose any double knit wool for your order, please fill in the box with as much detail as possible.